Users of Epson printers are no doubt all too familiar with the steep prices of their ink cartridges. Our cloned compatible cartridges for Epson printers are made to provide you with the equal superior performance and operation when compared to the expensive original printer cartridge. If you have previously been daunted by the possibilities of incompatibility issues of low yield OEM Epson ink cartridges, we invite you to try out our cloned cartridges for Epson below. They will not pale in comparison in terms of output and yield. Bundle up and save with our Epson Buy 2 Get 1 Free cartridges. Compatible Epson Ink Cartridges at Cheap Prices! Shopping for Epson printer ink cartridges online can be a frustrating experience because there are so many choices and conflicting options. We offer the latest line of Epson inkjet cartridges available from black to color. Our discount cartridges for Epson printers are an economical choice that deliver the performance, quality, and printing solution you desire for your business and home printer needs. You can rest assured that they have equal color quality and page yields as the originals and are also backed by our 100% Satisfaction Guarantee. Choose from the list of cheap Epson ink cartridges or printers listed above to find the equivalent cartridge for your printer. You will surely be impressed by our remanufactured Epson ink cartridges' ability to produce crisp, clear prints offering quality output for all you printing needs. Our discount cartridges are durable and economical. Compare our prices to Epson's, try our quality, and you'll be a repeat customer. Order from us today to experience it for yourself! Unlike Canon ink and Brother ink, as well as many other manufacturers in the printer market, all Epson printers make use of piezoelectric crystal technology instead of thermal inkjet technology during the printing process. The crystal changes in size and shape that coerce the ink droplet to run out from the nozzle. The advantage of using this method is that smaller ink droplets than the regular thermal inkjet allows can be produced to mirror minuscule details of intricate images. But the disadvantage of Epson's printer technolgy is that their print heads are prone to clogging. The print heads are the tiny, hairbreadth fine nozzles. The ink cartridges are just the reservoirs which hold and supply the ink to the printer heads. The print head scans the page in horizontal strips, using the printer's motor assembly to move it from left to right and back again. The ink is emitted from the nozzles while they pass over the paper. The paper then feeds and moves on ready for the next strip. When the cleaning cycles do not solve the problem, we have found a cheap method of unclogging these fine printer nozzles. I hate to say it, but Windex does work. It is its main chemical, ammonia, that does the dissolving. If your printer head is not removable, you can inject Windex into an empty ink cartridge and run print head cleanings to get the solution into the print head. Alcohol, to the contrary belief, does not unclog the printer heads. It may work for a short while but the alcohol will actually increase the chances of another clog. It dries out the plastic and metals in the printer heads. 1.) Always turn your printer off whenever you are not using it. Epson runs a cleaning cycle every time it is turned on. This cycle gets the ink flowing though the print head. If you never shut shut off your printer, it will not run this cycle. 2.) Print regularly. This will help keep the ink from drying out on the print head or in the nozzles. This is one of the biggest and most common faults of any inkjet printer. 3.) Use quality printer ink cartridges. We at InkCloners.com, take great care to make sure the supply of ink or the ink cartridge is compatible with the original manufacturer's brand. We only sell quality reproductions that will meet or exceed your expectations and our prices will be at a fraction of what the OEM's charge. You may finder cheaper online merchants, but cheaper is not always better. Noone is able to compete with our "Brand" of cloned Epson ink cartridges. With quality second to none, we will never be the cheapest cloned Epson ink vendor out there, but we will offer you a product that will keep you happy for years to come. 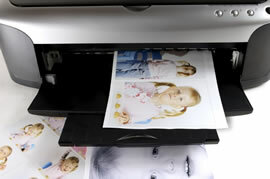 Eventhough, Epson printers are an ideal choice for consumers who often need to print out highly detailed graphics. Another benefit of using Epson printers is that the ink reacts favorably under heat, and so the ink cartridges can be used to produce incredibly beautiful prints no matter how detailed.